French police have said that the operation continues this morning. Five police officers have been lightly injured. 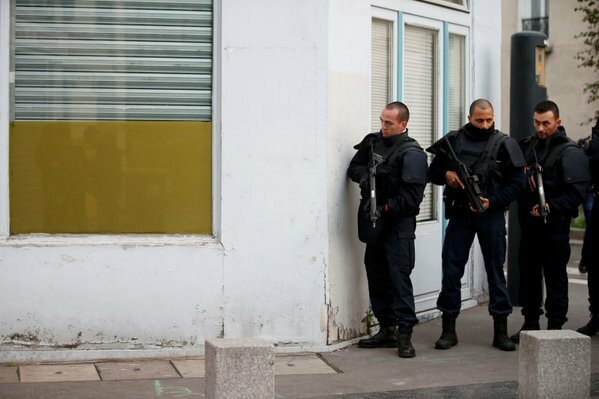 Armed police searching local people in Saint-Denis this morning. Le Monde says it has spoken to police sources who confirm a second suspect died in this morning's raid. 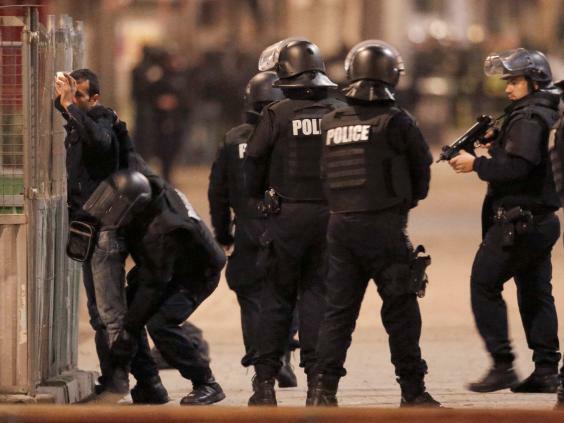 The centre of Saint-Denis is in complete lockdown as the operation continues. 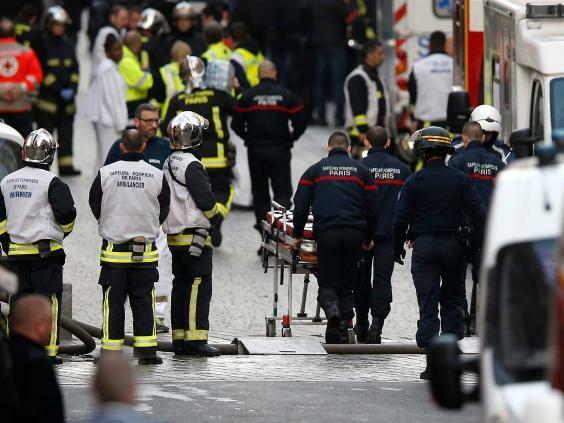 Schools have not opened, students and lecturers have been told not to go to the University of Saint-Denis, Paris Metro line 13 is partly shut, roads are closed and residents have been asked to stay inside. The BBC is talking to a Saint-Denis resident called Kid Collins. He says he initially thought the explosions and gunfire were fireworks and "no one could believe what was going on". "Saint-Denis is outside of Paris, it's not in the capital, so we were wondering why there would be an attack at this place at this time," he said. "Then we heard on the news it was a police operation going on." Le Parisien reports that jihadists on Twitter are wrongly sharing an image of a woman wearing a veil who they incorrectly claim is the woman who blew herself up at the beginning of this morning's raid. Witnesses are reporting that a man has been taken out of the besieged building by armed police. The reports are unconfirmed. The Syrian Observatory for Human Rights says air strikes on the northern Syrian city of Raqqa and its outskirts over the past three days have killed at least 33 Isis militants. They were mostly killed when their checkpoints were attacked by French and allied planes. The Observatory says more Isis fighters are believed to have been killed in the strikes, but their bodies were so severely dismembered it wasn't possible to give an estimated figure. Reuters reports that the suspects targeted in Saint-Denis may have been planning an attack on Paris' La Défense business district. The claim has not been confirmed. 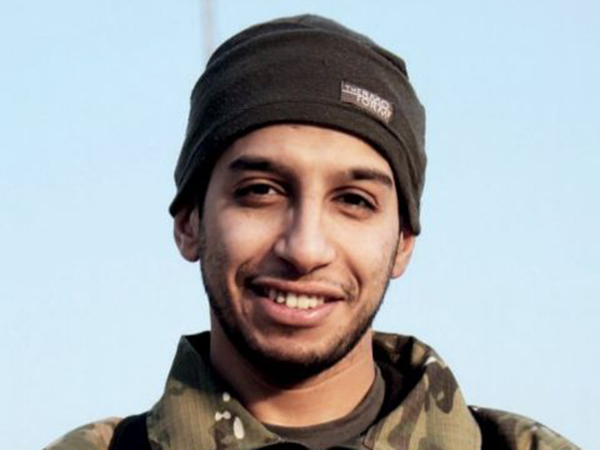 The IndependentAbdelhamid Abaaoud, the suspected mastermind behind the Paris attacks, has been identified by police as the prime target of a major raid in a northern suburb of the French capital. While it remains to be seen whether or not Abaaoud was holed up in the apartment under siege by police on Wednesday, more details have emerged about the man thought to have arranged the shootings which killed 129 people last Friday night. iTele reports that there have now been a total of seven arrests, including three 'terrorists'. 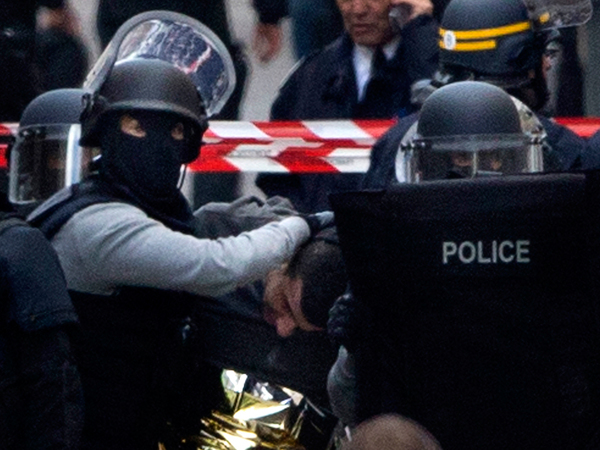 This is the first photo of a man being arrested in Saint-Denis after the siege of a flat believed to hold suspects linked to the Paris terror attacks. His connection to the operation is unclear. 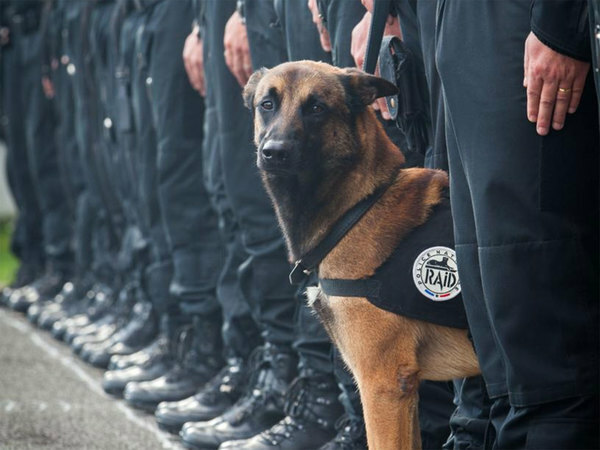 France's national police service has shared more details of the police dog killed in this morning's raid. He was called Diesel and was seven years old. "He was killed by terrorists," a statement says. Exclusive: security source inside cordon tells @Channel4News caution exercised in case Abdelhamid Abaoud buried under rubble of explosion. French media are now reporting that two people people have been arrested in the building, bringing the total number of arrests to seven. 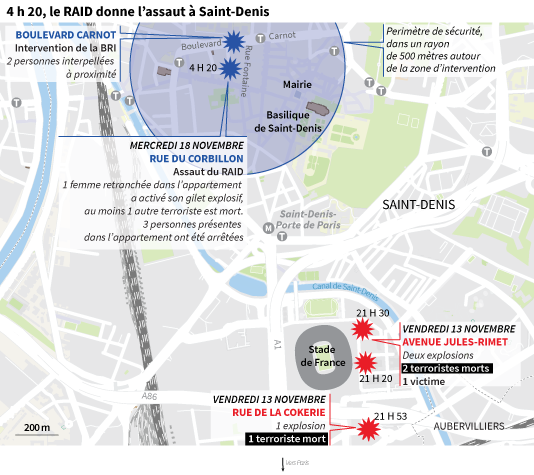 France 2 reports that the Saint-Denis operation was triggered because of intelligence indicating an attack was being planned in the La Defense business district of Paris. 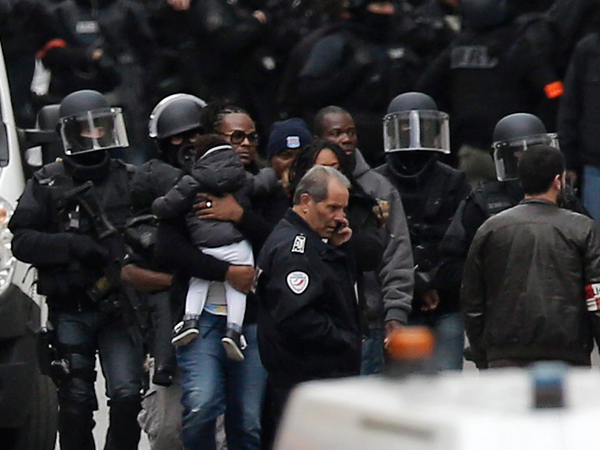 Live television images are now showing local residents with young children being escorted through Saint-Denis near the besieged flat, suggesting the operation is close to completion. As the situation continues, a bill to extend France's state of emergency for three months is being presented to a Cabinet meeting. Francois Hollande initially brought in the measure for 12 days following Friday night's attacks and Parliament must approve extending it. The bill is to be debated in the Cabinet on Wednesday, the lower house on Thursday and at the Senate on Friday. It would extend some police powers of search and arrest and limits public gatherings, among other changes. 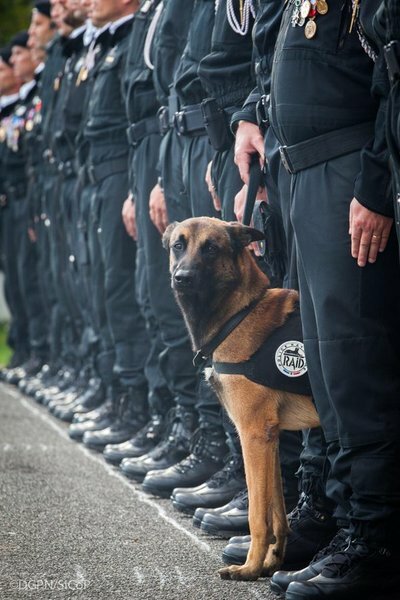 The IndependentFrench officials have named a police dog which was killed during a major counter-terror operation in the northern Parisian suburb of Saint-Denis. Police targeting the suspected mastermind of the Paris shootings, Abdelhamid Abaaoud, raided a number of apartments in Saint-Denis in the early hours of Wednesday morning. At least five officers suffered minor injuries in the raid, some after a woman at the scene detonated a suicide vest full of explosives. A journalist for Spanish newspaper El Pais says he heard an 'explosion' near the apartment around five minutes ago. Sky News journalists also said they heard loud noises but could not confirm what they were. The raid is now over but the area is being secured, AFP reports. The IndependentA suspected terror cell arrested during a huge police operation in Saint-Denis this morning may have been planning an attack on Paris’ business district. A female suicide bomber blew herself up as armed officers raided an apartment in the suburb before dawn and another suspect was reportedly shot dead during a gun battle. BFM TV reports that the female suicide bomber who blew herself up was suspected of harbouring Abdelhamid Abaaoud by police. A spokesperson for the French government, Stephane Le Foll, is talking about Abdelhamid Abaaoud on Sky News. He said he had connection and friends in both Brussels and Paris. He confirms that the operation is over and that it was enabled by measures under the current state of emergency. 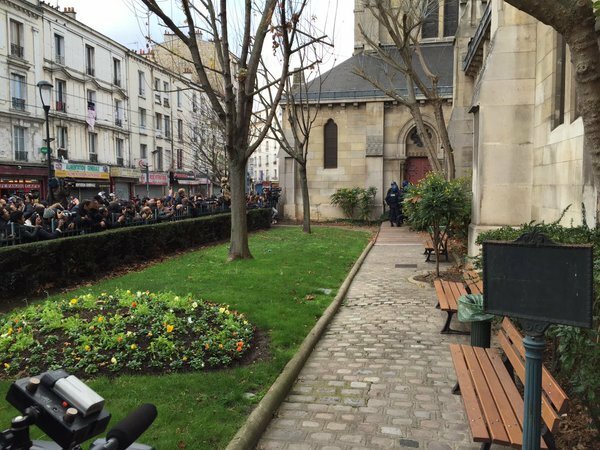 Our correspondent Kim Sengupta in Paris is reporting that police are now trying to force their way into a church in Saint-Denis. The reason for the operation is unclear and the number of officers is much lower than seen by the apartment earlier. Police have now entered the church but the reason for the raid is still unclear. Sources at the scene tell The Independent there are rumours that a cache of weapons is hidden inside the church. As that situation continues, armed police and soldiers have moved out of the raided apartment and forensics are going in to take fingerprints. Officers are also taking blood and DNA samples of arrested people to identify them. No names yet confirmed. The public prosecutor is currently speaking in Saint-Denis. He says the operation was linked to the Paris attacks on Friday. He says that no one has yet been able to enter the raided apartment but that intelligence suggests that Abdelhamid Abaaoud was "in the apartment". He said a man was killed when he was hit by a grenade and bullets. 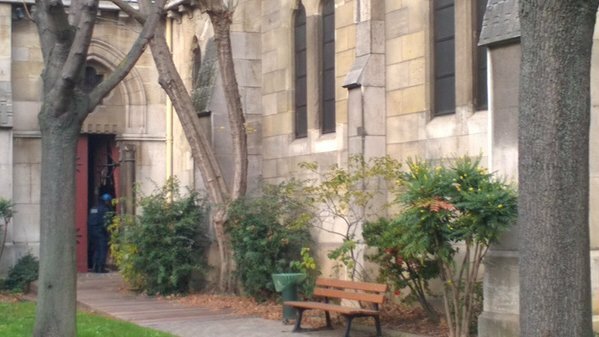 The IndependentA cache of weapons could be inside a church being raided by police in Saint-Denis, sources say. Officers were seen trying to break down the door to the historic Église Saint-Denys-de-l'Estrée this morning, hours after two suspected terrorists died in a nearby apartment. Three people in the apartment were arrested, and a young woman wearing a suicide vest blew herself up. Two others, the man who provided the flat and an acquaintance, were also arrested. There has been speculation that the female suicide bomber is a relative of Abdelhamid Abaaoud but it cannot be confirmed. 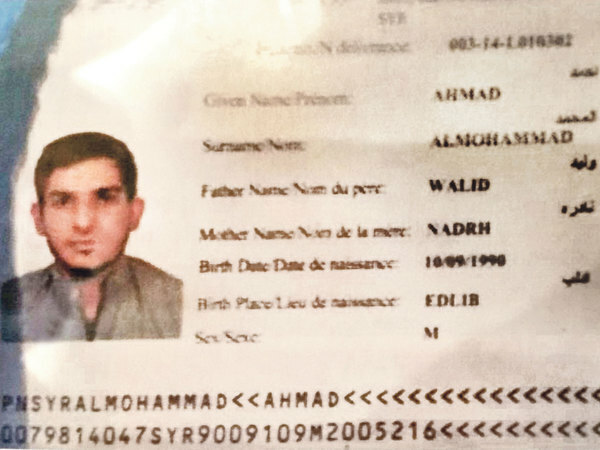 Meanwhile, all 129 victims of the Paris attacks have been formally identified. 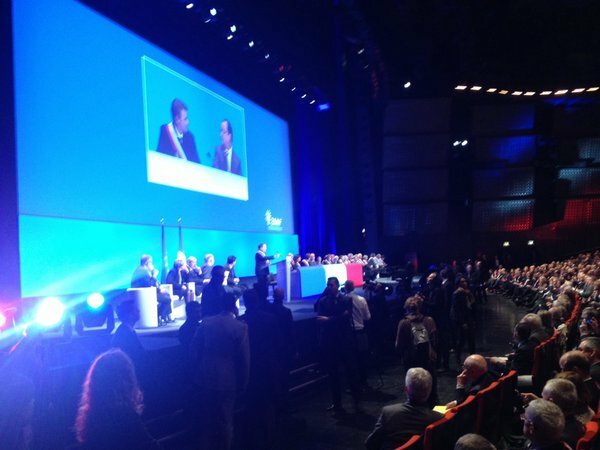 Francois Hollande will shortly be speaking to a conference of mayors. He has been presenting a bill to extend the current national state of emergency to Parliament this morning. 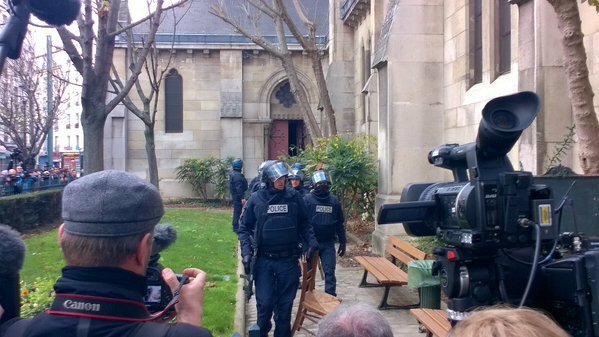 Police have now left a church in Saint-Denis after being filmed breaking down the door. The reason for the raid and its result has not been confirmed. The National Assembly of Mayors meeting continues. President Hollande has not yet spoken. Anne Hidalgo, the mayor of Paris is now speaking to the conference. "We will not give them the honour of fear but we will be on our guard," she says. "We're standing up, we will stay the same, we will show our collective identity as Parisiens and French people to the world." She says you don't have to be born in France to be French. Parisians are attached to the "art of living", she says and commit to living freely and in peace. She says people have the ability to live together "culturally and religiously". "As a Parisien, I invite everyone irrespective of their political leanings to reject what would divide us," she says, appearing to refer to hate crimes and scapegoating. "We owe that to the people who died." The IndependentClaims that a surge in the number of refugees entering Europe from Syria has allowed jihadists to sneak into France, Germany and Belgium unchecked and unnoticed have propagated in the days since Friday's Paris terror attacks, in which 129 people were killed and hundreds more were wounded. Meanwhile, PMQs is kicking off in Westminster and the Paris attacks and Britain's security is expected to dominate. Follow our live blog on that here.